Important note: Payment must be recieved within 48 hours of auction closing. 1. Wire Transfer- please email saralyn@peoplesauctioncompany.com for information. 2. Certified Check- Made payable to: Peoples Auction Company, Inc.
3. Cashiers Check- Made payable to: Peoples Auction Company, Inc.
Bidding closes on the first item at 8:00PM EDT, then closes at a rate of 1 item per minute thereafter in catalog order until bidding on all items has closed. AUCTION INSPECTION DAY: By appointment only. Please contact David Jordan to schedule your appointment to inspect at (757) 418-2510. 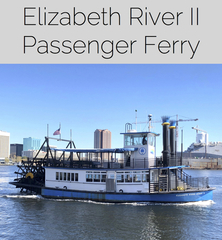 REMOVAL DAYS: The Ferry must be removed no later than January 30th at 5pm. Please contact Mike Perez to schedule your appointment to remove at (757) 222-6000 ext: 6691 or mperez@hrtransit.org.